Join us for a talk by Omar Barghouti, co-founder of the international movement for the Boycott, Divestment, and Sanctions (BDS) of Israel, in which he will discuss the intellectual, legal, and moral reasons for supporting the boycott as a means of non-violent resistance. Omar Barghouti will be joined by Chicago-based activist Page May of We Charge Genocide. They will be speaking about the connections between the Palestinian struggle for liberation against Israeli occupation and the racist systems of policing and mass incarceration here in the United States. The event will be moderated by John J. Mearsheimer, R. Wendell Harrison Distinguished Service Professor of Political Science, The University of Chicago. Professor Mearsheimer is an accomplished theorist in the field of Political Science and International Relations, and his book "The Israel Lobby and U.S. Foreign Policy" investigates the influential role of the pro-Israel lobby in effecting US policy in the Middle East. 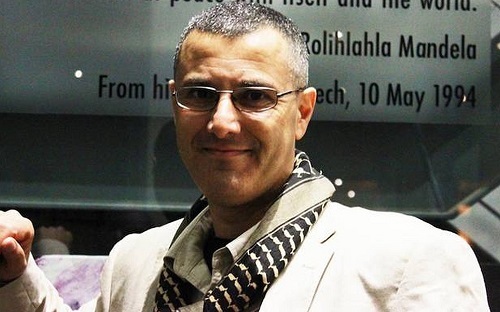 Omar Barghouti is an independent Palestinian human rights activist. He is a co-founder of the Palestinian Campaign for the Academic and Cultural Boycott of Israel (PACBI) and the Palestinian civil society-led Boycott, Divestment and Sanctions (BDS) movement against Israel. He is a non-resident Research Fellow at the International Institute of Social Studies in The Hague. He holds bachelor’s and master’s degrees in Electrical Engineering from Columbia University, NY, and a master’s in Philosophy (ethics) from Tel Aviv University. He is the author of, BDS: The Global Struggle for Palestinian Rights (Haymarket: 2011). His commentaries and interviews have appeared in the New York Times, the Washington Post, the Guardian, and on Bloomberg TV, MSNBC, CNN, BBC, among others. Page May is a prison abolitionist and an organizer with We Charge Genocide. 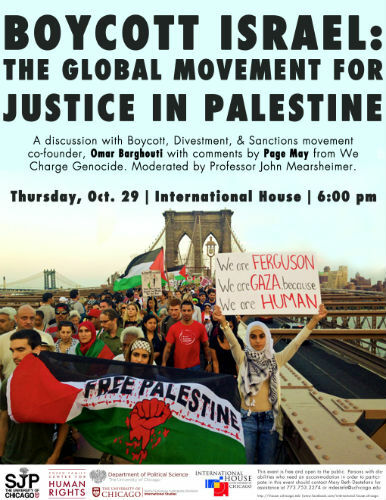 Presented by the Global Voices Lecture Series, Students for Justice in Palestine at the University of Chicago, The Pozen Family Center for Human Rights, the Department of Political Science, and the Department of International Studies.